Virgilio Carrion wears lots of hats at Frog Hollow Farm, including his signature sombrero. You might call him a Jack-Of-All-Trades because of his wide skill set and list of responsibilities on the farm. His primary responsibility is to lead and manage his 8-person year round Ground Team. This time of year and throughout the fall the Ground Team is busy keeping the trees irrigated, fertilized, and keeping the cover crop cut in between orchard rows. In the winter, they continue to keep the weeds at bay, but their focus shifts to removing all the pruned branches from the 30,000 trees in the orchard and then converting those branches to wood chips to feed our compost, which will in turn act as fertilizer for the orchard. Virgilio is responsible for preparing all the ingredients for our compost and is in communication with Farmer Al and Christophe, our compost specialist, about keeping our compost teeming with beneficial microbial life. Virgilio, or Virgil, as Farmer Al calls him, is also FHF’s go to guy to fix all things mechanical. He has an innate understanding of the workings of machinery and can figure out how to fix them when they break – an extremely valuable skill set on a farm! Farmer Al describes Virgilio as responsible, observant, detail oriented, and energetic. His observations and suggestions are highly valued and he is good at reminding Al of important operational priorities, like remembering to call the Irrigation District in the spring to turn on the water pumps! He also has an innate understanding of plants and how to make them thrive. Virgilio was in charge of planting all the tomatoes this spring and has been carefully overseeing their growth. His diverse skill set, excellent managerial skills, and warm heart make him one of the key guys that we depend on for keeping the orchard a healthy and happy place. Virgilio has been with Frog Hollow Farm for 18 years and the Ground Team Leader for 12. He is a family man with a wife and two boys, 14 and 20 years old. 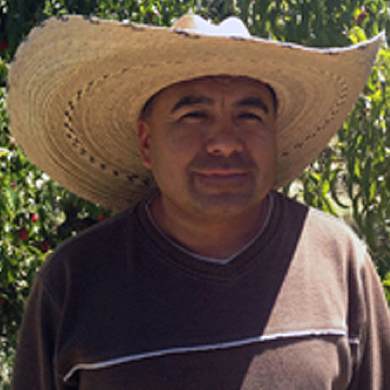 Virgilio enjoys all aspects of his work and his most favorite FHF fruit is the Cal Red peach.